This scented body gel softens and hydrates with Lemon, Lavender and Vanilla . Mild foaming bubbles gently cleanse your delicate skin. Shea Butter, Red Marine Algae, Peptides, Gingko Biloba Root Extract, Aloe Vera Leaf Juice, Vitamin E, Chamomile Extract and Dead Sea Salts provide reviving and toning properties in this skin loving gel. Easy to use in the shower or bath. 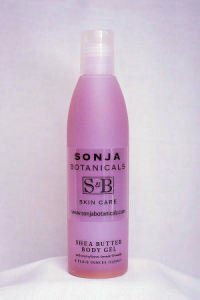 Shea Butter Extract is from a tree that grows wild in Central Africa. Red Marine Algae is from the Hawaiian Islands and improves moisture and increases skin firmness. The Dead Sea Salts are well known for their purifying properties.